Baby Doll Nancy is our gorgeous blue eyed beauty. 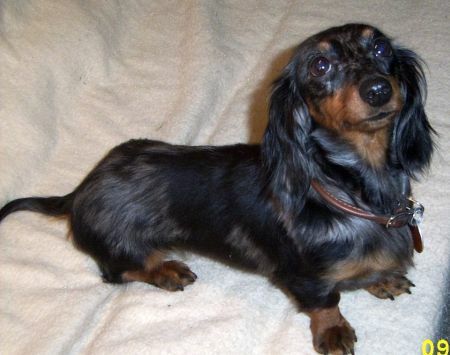 She is a silver dapple, smooth coat, mini Dachshund. Baby Doll Nancy just had her first litter. She is a year and a half old, and had six very beautiful babies, including a couple of blue eyed babes just like their mommy. I will be posting pictures A.S.A.P. 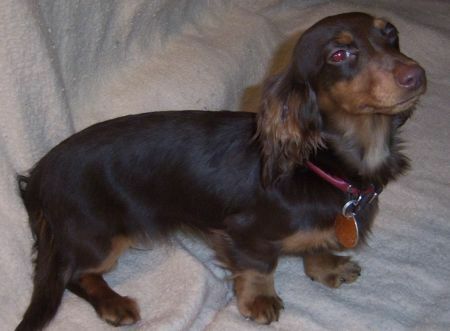 Bootsy is a beautiful long hair dapple. 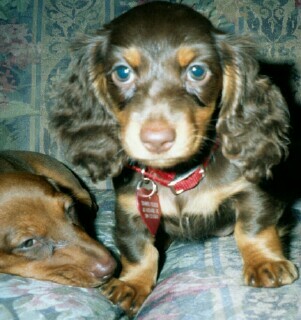 She has had her first litter in October 2001. She had 4 boys and 2 girls. All beautiful, just like their mommy. Three of the boys and one girl were all Sables. 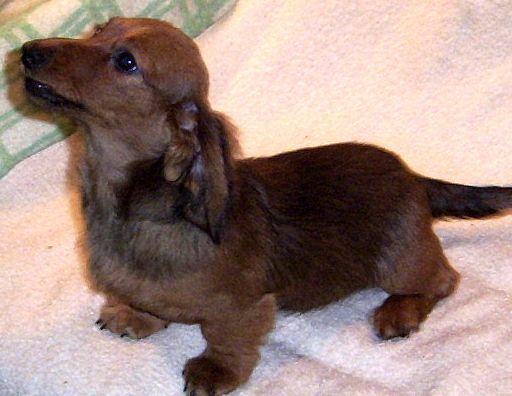 Sable is a red undercoat with a darker red or black overcoat. You can see exactly what it looks like if you go to our Puppies For Sale page. Buster, Blaze and Boyfriend are all Sables. 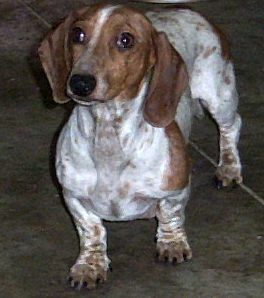 The other boy was a red dapple. Very pretty. 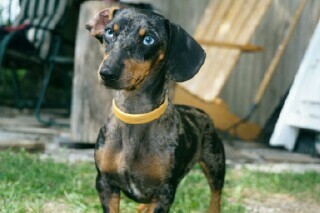 And last, but not least the other female was a beautiful silver dapple. Quite a variety of colors from one little sweety. Bootsy will be having her second litter approximately the same time this year. This is our little sweetheart Willie. 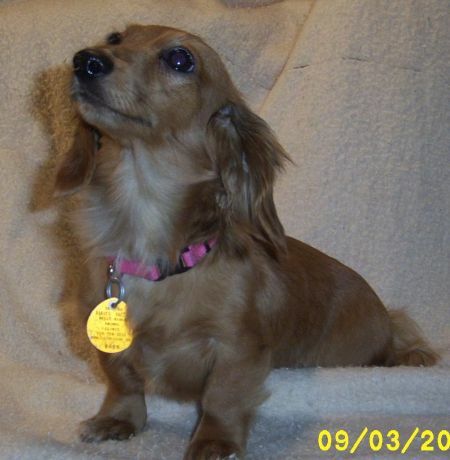 Her color is red and she is a long hair Miniature Dachshund. Willie is 2 1/2 years old. She has just had her second litter. Gorgeous long hair babies.One is cream, one is a chocolate dapple, and last, but most definately not least is chocolate and tan. All three are gorgeous little girls. Her first two babies are Thumper and Patches. You will find pictures of these beautiful sweeties on our site. Willie produces puppies, so far all girls, and the most gorgeous and softest hair you have ever felt. If I was to compare their fur to a man made material I'd have to say cashmere. THESE GIRLS ARE NOT YET MOMMIES. When this picture was taken Thumper was approximately 3 months old. 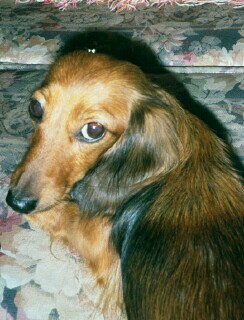 Lucy is a long hair, red female. She is now 6 months old. Again, another Puppy With a Great Personality. We spend many hours nuturing our little babies just so that they will be so Loving and possess very little, if any anti - social behaviours. 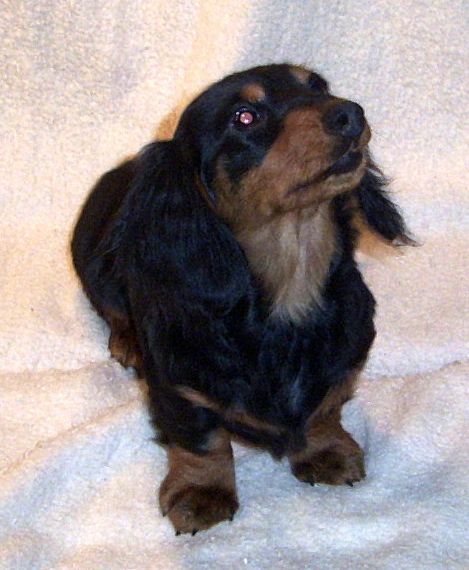 Callie Anne is a long haired Black and Tan. Just click here to e-mail me. This picture was taken on March 10, 02. Thumper is nearly 9 months old. Thumper, like Patches, is Charlie and Willie's daughter. On our Puppies For Sale page you will see another of their children. Her name is Glitter. THIS BEAUTIFUL LITTLE GIRL IS PATCHES. He is Willie's Husband. Patches and Thumper's and Glitter's dad. Charlie from a different angle. It's not hard to see why Willie and Charlie produce such gorgeous girls.